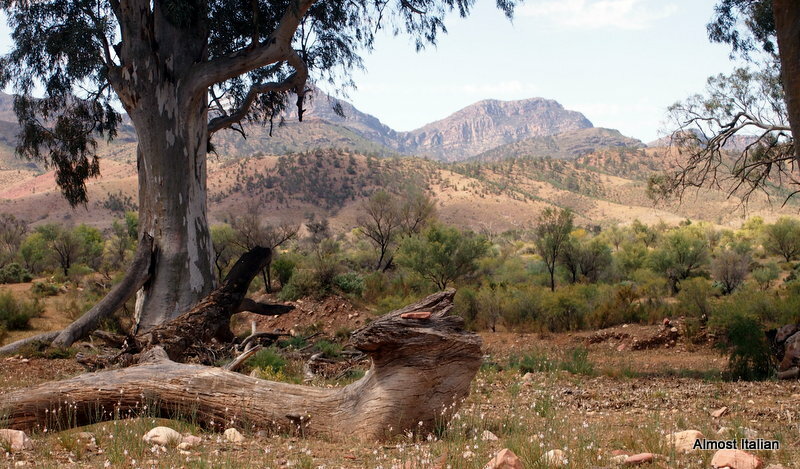 The Flinders Ranges enable the visitor to experience beauty on a grand scale, either through walking and hiking trips or driving around the ranges. 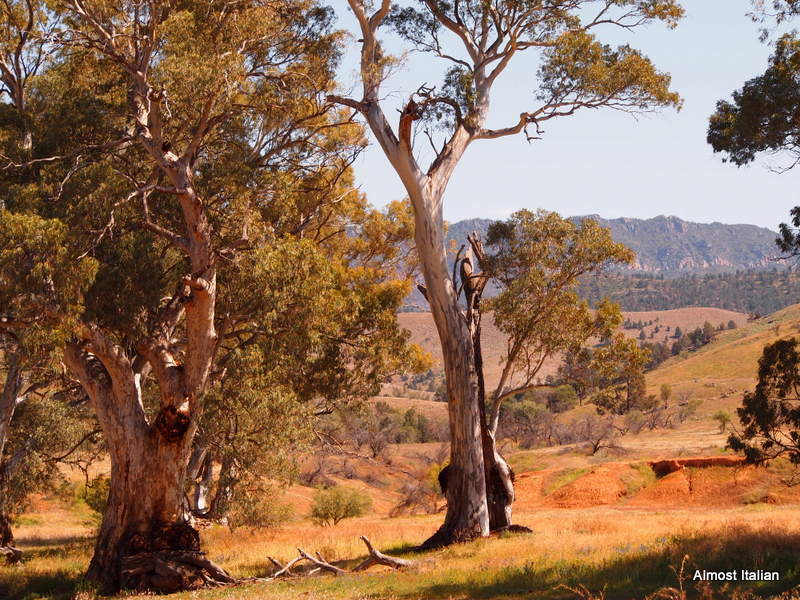 The day trip to Bunyeroo Track and Gorge, through Brachina Gorge, as well as the Aroona Valley, the latter with a bush camping ground and natural spring, passes through some of the most beautiful outback landscape in this country. It’s not easy to capture this beauty, either in words or photos. Travelling through this landscape, I am overawed. My thoughts race, beyond reason, beyond words. I am a small creature passing through a momentous art installation. I begin to recall the works of Hans Heysen, whose art was popularised in print form, commonplace in homes and motels in the 1960s. That tasteless retro era comes flooding back, childhood memories tinged with melancholy, and I see this bush again, I am a part of it, it’s there in my consciousness but I’m not prepared. The land is dignified, venerable, unspeakably beautiful. I think of the traditional owners of this land, whose love of country is unsurpassable and is inextricably woven into their legends, culture and identity. It is about being: experiencing beauty on a grand scale, limitless skies and ancient forms, and letting go of all else. A passing cloud highlights the relief of that distant ridge- chiaroscuro, a stage, a light show. Next minute, it has disappeared, new colours and shapes emerge. Art and theatre. Do the landscape paintings of your memories influence and enhance your perception of the landscape? Or does the power of landscape simply remind you of the painting? Do older Australians have a pre-disposition towards this beauty, based on learning through art and history? Would this landscape be so familiar and lovely to the visitor from the northern hemisphere, whose eyes are trained to see younger, greener and moister views? How is it that your photos bring up feelings of nostalgia for me? I was not brought up in the wide brown land, but it is somehow part of me too. I think I view paintings of it as separate entities to the land, evocative but different somehow. There is a school of thought that believes the medium adds its own layer of energy to the inspiration. Lovely post, Francesca. Thanks Ardys. I found it hard to order my thoughts for that post. And I appreciate your wise thoughts on the matter too. I think you pick up on that nostalgia because you live close to this land, your eye is trained to understand its moods. Yes, that first photo started this stream of consciousness about art, nature and existence. All indigenous sacred sites are well chosen for their beauty and sense of spirituality, it is true. Thanks for your thoughts on the matter, another lover of this ancient land. Ah, yes, your first, glorious, shot reminded me of a painting – the light: it glows in a most painterly way! It’s interesting: my Mother, several generations a Queenslander, never felt the beauty, while my father, arriving fresh from England at 16 – was seared by it. I don’t remember his actual words, but it was as though what he saw, sailing into Sydney Harbour and continuing west on the Hay train somehow replaced his DNA. Maybe it was because he was a farmer – or rather, wanted to be a farmer, he just absorbed it through his fingers. That’s interesting- your father’s intrinsic love of the land. One of my Italian guests, from Milano, has this same appreciation. He has walked the Larapinta Trail and has just finished a trek through the Simpson desert: he understood this beauty immediately but many can’t. Thanks for adding your thoughts to my rambling post. Stunning post, Francesca, and yes, I too am reminded of Hans Heysen’s work. Just glorious! Thanks Lizzie- it is such a special place, and to be in the middle of it leaves one speechless. Thanks Leah, it is a magical place, and I don’t know if you have travelled to these parts, but when you do, you will see your great grandfather’s work everywhere in that bush. You have captured our native landscape with an artistic and skilled eye, much in the way of Hans Heysen and Albert Namatjira. I say “our” because even if we don’t hale from a particular locale the entire Australian (and elsewhere) landscape resonates with many of us; a collective belonging. An interesting exercise is to explore via birth data Astrodienst’s – http://www.astro.com/cgi/aclch.cgi?btyp=acm&amp; – AstroClick Travel, gives you information about the astrological influences you may experience at a given place on earth. Must try this link and find my astrollogical influences. 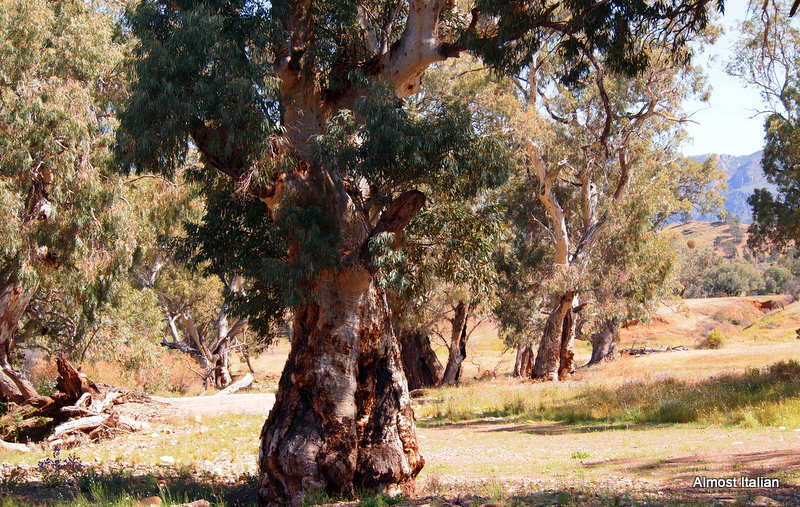 Some other parts of the outback are very ‘Namatjira- esque’ or Hermannsbug. I often see landscape like my favourite aboriginal artist- Rubuntja too. I like that phrase- a collective belonging. I never thought much abot Heysen until I went down that track. How beautifully you have captured the sparse beauty of this region through your photos and words. Thankyou kindly- I found the words weren’t coming so easily. What beautiful paintings! Makes me yearn for a holiday where there is little to distract but the view. hahahha, yes, thanks for the poem plant! 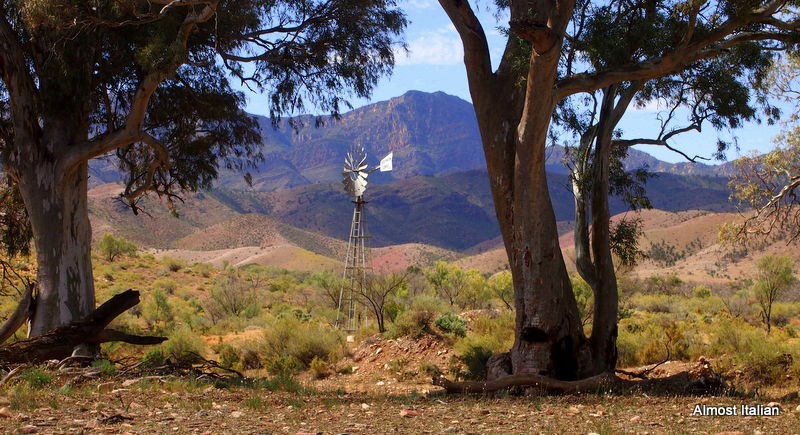 You have captured the Flinders Ranges so beautifully. What an exquisite place. Beautiful! I’m not familiar with Hans Heyson, so am not influenced by preconceptions.However, I have seen so much of the American west that is comparable to these sorts of landscapes and am also next door to the moors of Yorkshire (more vast expanses of non-greenness). I know the feeling of awe when you experience nature at this level of magnitude. The moors are on my list. I have a friend in York with a spare apartment so must take up this journey one day. Landscape beauty, anywhere, is awesome. ( bad word,I know,but I am using it in the old way). Australia is a beautiful country indeed. 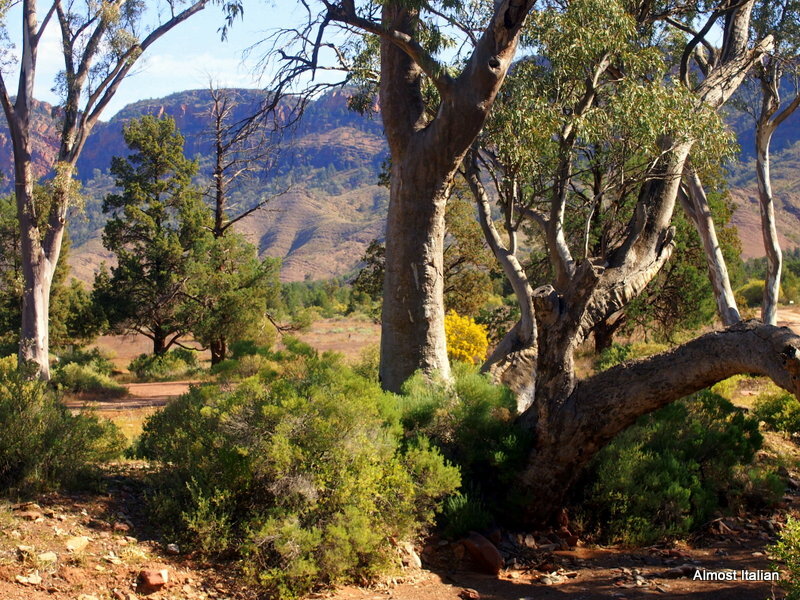 It is indeed, I often yearn for the outback and then we do a long road trip. Previous Previous post: Spring on a Plate. Cucina Povera.